I have not purchased a new bag in over 3 years. I've been making my own & it was time for a new one. I wasn't feeling like making one though. I have too much to do. It was on the back burner. So maybe it's a little worldly, but every once in a great while it's okay to be a little worldly, right? Especially for such a pretty bag. 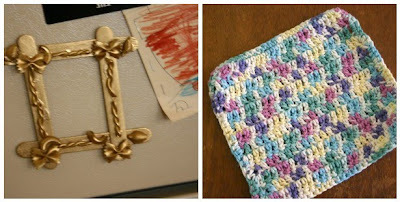 I also got an awesome pasta & popsicle stick magnetic gold frame from Sadie & a cute crocheted washcloth from my Grandma. It was a good Mother's Day indeed. As always...darling designs. Congrats of the sweet bag. I'm thrilled for you! What a great guy. Sometimes you need to splurge a little and I think it was a wise choice on his part. I can tell you're very busy and work hard so you deserved something pretty for Mothers Day. Great pillows, and the garland is cute as always. Love the bag! And the blue & red banner. i love those tooth pillows. so cute! and what a wonderful hubby to get you that sweet bag.